PV system prices continue to drop, the 30% Federal Investment Tax Credit has been extended for another three years, and PV modules and inverters continue to increase in size. Inspectors are seeing more and more supply-side connected, utility-interactive PV systems on residential and small commercial installations like the one in the lead-in photo. No, it does not connect directly to the 500,000-volt sub station in the background. 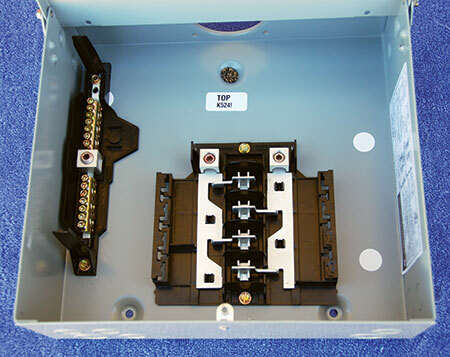 The 120% limitation in NEC Section 705.12(D) (load-side connections) for backfed circuit breakers of 20 amps (100-amp load center) or 40 amps (200-amp load center) inherently allows only a relatively small PV system for these buildings for load-side connected systems. Furthermore, with the relatively new technology of PV, the PV installers [also, many new to the electrical power trades and the National Electrical Code (NEC)] are investigating new and creative methods of connecting PV systems to the grid. NEC Sections 230.82(6), 705.12(A) and 705.31 covering the supply-side connections do not have many details; so other sections of the Code need to be investigated to ensure that these connections are safe and code-compliant. A quick scan of the sections below should reveal at least one or two questions that may have come up during recent inspections. Most, but not all supply-side PV connections are made to the service conductors between the meter location and the main service disconnect. This assumes that the meter is the closest device toward the utility supply and that a net-metering connection is desired, allowed and/or required by the local utility. In some jurisdictions, a zero sequence or cold meter socket is required by the local utility and the main disconnect may be ahead of the meter socket. In either case, the allowance of NEC 705.12(A) is for the connection to be made on the utility side of the main service disconnect. Local utility requirements will determine where the PV connection can actually be made, and, of course, the utility will have to be notified to turn off power to the service before the connection is made. It is usually acceptable to open the raceway between the disconnect and the meter, insert a j-box and make the connection using appropriate splicing devices. As mentioned previously in this series of articles, the PV inverter output connection cannot be made to the internal bus bars or conductors between the meter socket and the main breaker on a meter-main combo panel or in large switch gear unless those conductors or busbars are factory marked as tap points, the manufacturer’s instructions and hardware are available and the utility OKs the connection. Otherwise the listing on the combo panel would be violated. Special, listed PV connection meter socket adapters are available from several sources, but may or may not be approved for use by a local utility. These automatically provide a set of “PV ready” terminals that are connected to the load side terminals of the meter. Several load center manufacturers make “ranch panels”, which have a 400-amp input busbar and two, 200-amp breakers connected to that busbar. One of the breakers feeds a normal load center busbar and the second 200-amp breaker is available for a supply-side PV connection. In all cases, the connection will be to service-entrance conductors and any devices, methods or equipment used must comply with the requirements for such connections in this environment. For example, a short-circuit current rating (SCCR) might apply to any meter socket, busbars, fuse holder, disconnect or terminal block which might carry fault currents. Size of the PV “Tap” Conductors. The word “Tap” is placed in quotes because the Article 240 Tap Rules should not be used in making PV connections to the service-entrance conductors. The Tap Rules were developed assuming that there is overcurrent protection on the conductor being tapped ahead of the tap point. The overcurrent protection for service-entrance conductors may be on the primary side of a distribution transformer feeding several sets of service-entrance conductors. Available short-circuit currents may be quite high. It would not be appropriate to connect a 10 AWG PV inverter output circuit to a set of 3/0 AWG conductors for 200-amp service, unless, of course, there was an expectation and acceptance that those 10 AWG conductors would act as a very poor fuse under a fault condition (photo 1). Photo 1. Supply-side PV connection to output terminals of meter socket using conductors that are too small. Double lugging is also a code violation. The PV circuit conductors from the connection point on the service conductors to the first overcurrent device are subjected to the same available fault currents as the service-entrance conductors themselves. I strongly suggest that they should be the same size as the service conductors and routed and protected as service conductors as required in NEC Article 230, no matter how cumbersome that may be. Although these conductors are not specifically defined in the Code, “If it walks like a duck and talks like a duck and looks like a duck then …” Cable adapters may be required to make the connection between large service-entrance conductors and smaller terminals on lower current overcurrent devices or disconnects (photo 2). The maximum distance from the connection point to the first overcurrent device is specified by NEC Section 705.31 and that maximum distance is 3 m (10 ft.). Better yet, the PV ac disconnect/overcurrent protection should be installed at the connection point to the service conductors. One Possible Solution. Where space permits, it could be possible to open the service conduit or cable, insert the ac PV fused disconnect in the conduit run and then make the appropriate connections inside the disconnect provided there is sufficient room for such connections and the splicing devices. Using a disconnect with the same rating as the service conductors might facilitate the connections (proper terminal size) as would special multi-conductor terminals (where available) on the line side of the disconnect. 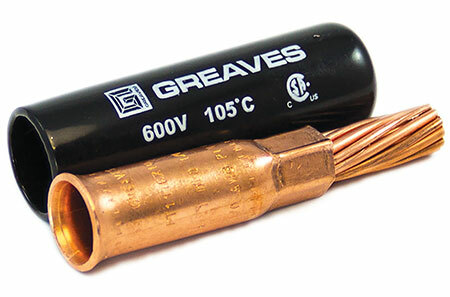 Fuse size adapters could be used to match the possibly smaller required PV ac output overcurrent device size to the more robust disconnect fuse holders. This action would probably ensure that the disconnect was service entrance rated and would also minimize (to nearly zero) any additional unprotected conductors. It would also meet 705.31 requirements. From the first overcurrent device on the PV ac circuit conductors back to the PV inverter, the circuit is a PV feeder and the conductors are sized based on the rated inverter output, the manufacturer’s instructions for the maximum overcurrent device on that output, and the actual rating of the overcurrent device [690.8, 690.9, 110.3(B)]. Available Fault Currents. Utilities in various parts of the country are making efficiency improvements in their distribution systems. They are installing more efficient distribution transformers in newer subdivisions, and those transformers have lower impedances and lower losses. The result is that the available short-circuit current at the transformer secondary will exceed the commonly used 10,000-amp number, and the service entrance equipment at the building will need to be rated for the higher available fault currents. The AHJ should require that the PV installer get the specification for the available fault current at the transformer in writing from the utility and provide the calculations for the available fault current at the service entrance equipment. This calculation will also apply to the first disconnect/overcurrent protection used on the supply-side PV connection circuit. In these cases, equipment rated at 22,000 amps or higher may be required. And, it should be noted that there have been a few cases where the distribution system has been upgraded and the existing service entrance equipment is now underrated. To provide high levels of protection for the PV inverter, it is suggested that fast-acting current-limiting fuses (e.g., type RK-1) be used as the first overcurrent protection device on the PV ac circuit nearest the connection point. Photo 2. Cable adapters allow larger cables to be connected to terminals designed for smaller cable sizes. Courtesy, Greaves. Multiconductor Connections. In some cases, each phase of the service-entrance conductors and the neutral will consist of two or more paralleled conductors. 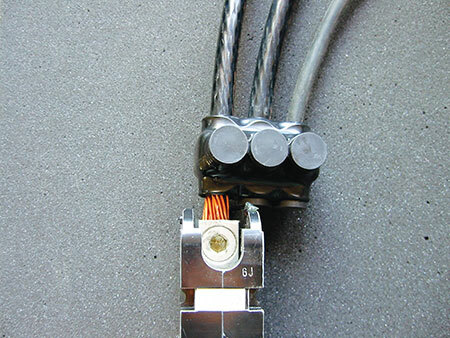 When making the PV connection, all conductors of each phase and the neutral conductor must be “tapped” to ensure that all currents remain balanced (300.3(B)(1), 310.10(H). Splicing blocks and other devices are available to facilitate these connections, but they do require space in the enclosures (photo 3). Photo 3. Splicing blocks can be used to tap services with multiple conductors per phase. Battery Backed up Systems. PV systems containing energy storage systems (ESS) (usually a battery bank) are becoming more common as outages due to natural disasters (hurricanes, snow storms, flooding and tornados) become more common and as battery systems for this application proliferate in the industry. See photo 4. Photo 4. Typical 10 KW AC Output battery backed up PV system. System is ac coupled with additional utility-interactive inverters located outside at the array. A utility-interactive multimode inverter is used in these applications and that inverter will have one ac input/output that is connected to the utility, a second ac input/output that is connected to the load circuits and a dc input/output that is connected to a battery bank. 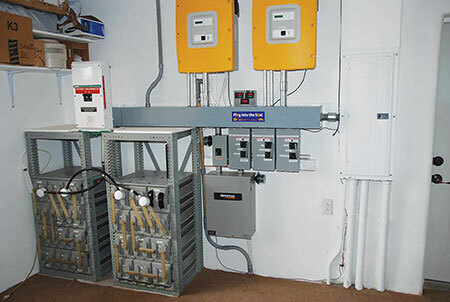 The PV array may be connected to the multimode inverter as an “ac coupled” system where a separate utility-interactive inverter converts dc PV energy to ac energy and feeds it to the ac load circuit that is connected to the multimode inverter. The multimode inverter charges the batteries from either the ac utility or the ac output from the PV array. Or, the system may be “dc coupled” where the PV array is connected to a charge controller that charges the batteries directly. And the multimode inverter will discharge the batteries into the load circuits or the grid when there is excess energy available or charge the batteries from the grid when necessary. In either type of system, it is important to note that the ac utility input on the multimode inverter may, at times, be a load on the utility feeder or service since it can pass through utility currents to supply loads under normal operating conditions. That input can also supply utility currents to charge the batteries when excess PV energy is not available. The amount of potential maximum load on the utility supply must be calculated and used in determining conductor sizes, overcurrent and disconnect device ratings and service entrance ratings. The load may be the entire building load when a “whole house” PV battery backed up electrical system is installed plus the load due to maximum battery charging. Or the load may be some subset of the maximum building load where only a few critical circuits are connected to the battery backed up PV system, but the maximum battery charging load must still be added to this load. Each type of multimode inverter from the several manufacturers will have software controls available to limit and otherwise control the various pass through ac currents to the connected loads, the ac currents that can be made available for battery charging and the maximum ac currents that can be supplied to or supplied from the utility source. The instruction manual for these relatively complex devices must be carefully reviewed to ensure that the appropriate software settings have been made and that the external circuitry is compatible with these adjustments. In general, these software adjustments must not be accessible to unqualified people. Photo 5. General Electric, 125-amp main-lug-only service entrance rated load center. With appropriate breakers, the panel has 22,000-amp rating. Two stabs can be used to convert the panel to a main breaker panel—but then supply-side connections cannot be made with remaining breaker positions. These main-lug-only service panels are common in some parts of the country and offer the potential for making a supply-side PV connection. See photo 5. However, there are a couple of possible pitfalls that must be addressed. A main-lug-only service entrance panel is limited to six circuit breakers (NEC 230.71). In a 200-amp panel, there will usually be a 100-amp breaker (leading to a subpanel) for general lighting and receptacle loads, a 30-amp HVAC circuit, a 40-amp electric range circuit and a 40-amp circuit for an electric water heater and one or two additional breakers up to a total of six. Note that the sum of these breaker ratings may exceed the panel and service rating (in this example, 210+ amps is greater than 200 amps), but the connected loads on these breakers as determined by the load calculations in NEC Chapter 2 may not exceed either the service or the panel ratings. See the notes in the NEC Handbook on 230.80 and 230.90(A) EX 1 for more information. In other installations, the sum of these load breakers may be equal to or less than the service rating or the panel rating. If there is an open breaker position for a PV backfed breaker, then this breaker is considered as a supply-side PV connection and can be made with the following considerations that the installer must address and the AHJ should verify. Potential Overloading the Panel Busbar. Where the existing load breakers have a rating total exceeding the rating of the main-lug only panel, the backfed PV breaker should be installed on the busbar position that is most distant from the utility main lugs input. Even if the loads are in excess of the bus bar rating, the PV input during PV production hours will not be able to overload the bus bar with currents that are in addition to those available from the utility. The currents from the PV system will tend to reduce busbar loading and service conductor loading when the PV system is producing power. Of course, when the PV system is not producing power, excessive load currents that do not trip the breakers could possibly overload the busbar and the service conductors. In this supply-side connection, the PV backfed breaker could have a rating up to the rating of the panel or the service, whichever is smaller. The AHJ should verify that the calculated existing loads on the panel are less than the panel rating and the service rating. And, if a multimode inverter in a battery-backed up PV system is being installed, the loads (battery charging or pass through) associated with that device must be addressed. Where the load breakers ratings total less than the panel rating, the PV backfed breaker could be installed in any position in the panel. The total currents delivered by the PV plus the utility would be limited by the load breakers. Even when the PV breaker is located adjacent to the main lugs, excessive currents could not be drawn through the busbar because of the total ratings of all load breakers. In this supply-side connection, the PV backfed breaker could have a rating up to the rating of the panel or the service, whichever is smaller. Potential Overloading the Service Conductors. Anytime that the sum of the existing load breaker ratings exceeds the rating of the panel or the service conductors, the AHJ needs to verify that the calculations for the connected loads do not exceed those ratings. Again, the multimode inverter will impose battery and pass through loads on the service and these must be addressed. The addition of the backfed PV breaker when positioned as mentioned above will not increase service conductor loading but will actually decrease it when the PV system is producing power by offsetting load currents. However, the addition of a PV source should never be used to justify having loads in excess of the service equipment or service rating since there may be high load days when the sun doesn’t shine. PV ac system output currents for the larger systems are usually too high for connection on the load side of the service disconnect and must be connected on the supply side of the service disconnect. The NEC allows such connections, but the existing service must be examined carefully to determine where the connection can be made and what type of equipment must be used to make the connection. 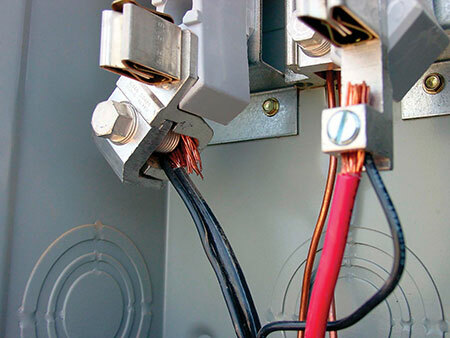 Available fault currents from the utility transformer will exist all of the way to the first overcurrent device on the ac PV connection circuit and will be similar if not identical to the fault currents available at the existing service disconnects. Loads on the existing service may be affected when a multimode PV inverter with energy storage is used.